"Grand Funk, Live Album - OBI Box Set of 6 Mini Replica LP Titles Making a 6 CD Box Set"
GRAND FUNK - LIVE ALBUM - Japanese OBI MINI REPLICA LP TITLES making a 6 CD Box Set- Japanese OBI MINI REPLICA BOX SET Japanese re-mastered Mini LP replica Limited Edition Collection Recorded from the finest Original Masters available. Each title Comes with anti-static sleeves similar to Vinyl LPs, Cardboard packaging exact to the original LP, Re-sealable plastic wrap cases for protection of each collectible and include extensive Liner Notes Booklet. Actual miniaturized version of the 12" LP in 4" CD version Special VERY RARE LIMITED EDITION BOX SET ONLY PRODUCED ON FUTURES FOR THIS ONE TIME PRESSING -- were only available in Japan. 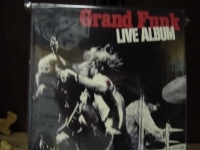 CD'S INCLUDED IN THIS BOX SET ARE - Japanese pressing is part of a reissue series of six albums from Grand Funk Railroad featuring bonus tracks, digital remastering and cardboard sleeve jacket designs. Complete series includes On Time, Grand Funk, Closer to Home, Live Album, Survival and E Pluribus Funk. ON TIME Track Listings 1. Are You Ready 2. Anybody's Answer 3. Time Machine 4. High on a Horse 5. T.N.U.C. 6. Into the Sun 7. Heartbreaker 8. Call Yourself a Man 9. Can't Be Too Long 10. Ups and Downs 11. High on a Horse [Original Version][#][*] 12. Heartbreaker [Original Version][#][*] GRAND FUNK - SELF TITLED WITH GATEFOLD COVER Track Listings 1. Got This Thing On The Move 2. Please Don't Worry 3. High Falootin' Woman 4. Mr. Limousine Driver 5. In Need 6. Winter & My Soul 7. Paranoid 8. Inside Looking Out 9. Nothing Is The Same (Demo) (Bonus Track) 10. Mr.Limousine Driver (Extended Version) (Bonus Track) CLOSER TO HOME - WITH GATEFOLD COVER Track Listings 1. Sin's a Good Man's Brother 2. Aimless Lady 3. Nothing Is the Same 4. Mean Mistreater 5. Get It Together 6. I Don't Have to Sing the Blues 7. Hooked On Love 8. I'm Your Captain 9. Mean Mistreater [Alternate Mix][#][*] 10. In Need [Live][#][*] 11. Heartbreaker [Live][#][*] 12. Mean Mistreater [Live][#][*] LIVE ALBUM - WITH GATEFOLD COVER Track Listings 1. Introduction 2. Are You Ready 3. Paranoid 4. In Need 5. Heartbreaker 6. Inside Looking Out 7. Words of Wisdom 8. Mean Mistreater 9. Mark Say's Alright 10. T.N.U.C. 11. Into the Sun SURVIVAL Track Listings 1. Country Road 2. All You've Got Is Money 3. Comfort Me 4. Feelin' Alright 5. I Want Freedom 6. I Can Feel Him in the Morning 7. Gimme Shelter 8. I Can't Get Along With Society [2002 Remix][*] 9. Jam (Footsompin' Music) [*] 10. Country Road [Unedited Original Version][*] 11. All You've Got Is Money [Unedited Original Version][*] 12. Feelin' Alright [Unedited Original Version][*] E PLURIBUS FUNK Track Listings 1. Footstompin' Music 2. People, Let's Stop the War 3. Upsetter 4. I Come Tumblin' 5. Save the Land 6. No Lies 7. Loneliness 8. Medley: I'm Your Captain/Closer to Home [Live][*] 9. Hooked on Love [Live][*] 10. Get It Together [Live][*] 11. Mark Say's Alright [Live][*] These are Japanese digitally re-mastered Mini LP replica CDs (the OBI Edition). This Limited Edition Collection has only VERY FEW made world-wide and are immediately Out of Print. Recorded from the finest Original Masters available. Comes with anti-static sleeves similar to Vinyl LPs, Cardboard packaging like an LP, includes extensive Liner Notes Booklet. Actual miniaturized version of the 12inch LP in 4inch CD version.